An elegant crossover ring, crafted from polished palladium 950, one of the most durable precious metals from the platinum family. 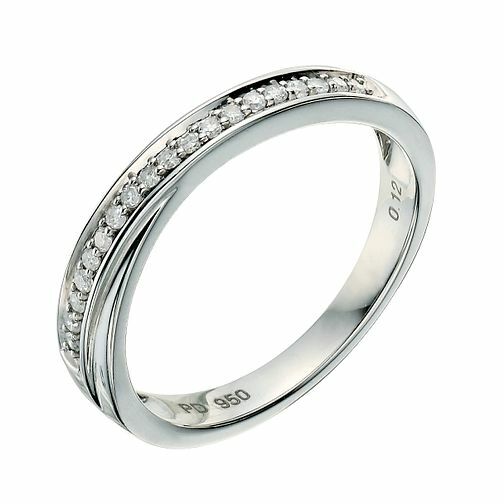 Finished with a glistening row of diamonds totalling 12 points, this ring makes for a stunning wedding or eternity ring. Palladium 950 12 Point diamond crossover ring is rated 5.0 out of 5 by 1. Rated 5 out of 5 by Anonymous from Beautiful stunning Ring My husband got this to go with my new palladium halo engagement ring for our 10th wedding anniversary really looks stunning together very pleased and love showing them off.